Ever wanted to rant about that someone you just can’t stand? Not getting any help from RJ Confessions? Try out Raffles Press’ new column, Ask Uncle Stamford, and our resident agony aunt (and uncle) Aunt Sophia and Uncle Stamford will be glad to help you in your Rafflesian troubles! Submit your questions to tinyurl.com/UncleStamford and we’ll give them our best shot. I have a PW groupmate who never does any work and it’s driving me nuts! I’m terribly worried that I’m going to fail my PW but I don’t know what to do about it. What advice do you have? Project Work with a (useless) non-contributive groupmate is the biggest of all Rafflesians nightmares! (other than failing math) We’ve all had that one uncooperative group member who never seems to be around when it’s time to do the work. Unfortunately, the sad truth of the matter is that you’re stuck with him for the rest of the year, and will probably still see him everyday for the following half a year. So as you read this, here’s some suggestions as to what you can do. With our busy schedules, multiple CCAs, competitions and other commitments, time management is a big issue for some of us. As a group member, perhaps you could resolve this problem amicably by clearly outlining, as a group, each member’s responsibilities. Even with the most recalcitrant of slacker groupmates, a firm but gentle reminder to complete his allotted share of work will surely spur him on to do his fair share (provided he has a heart – and if he doesn’t… we’ll deal with that later). Include clear deadlines in your timelines, so that he’ll have no excuse for “forgetting” or having no time to finish his share. So perhaps you’ve tried everything, but nothing – not even food (oh, the horror!) – seems to motivate that groupmate – perhaps he just doesn’t care at all. Well, nothing helps release pent-up anger better than a good long rant session with your friends, or for the more reticent, your parents, pillow or pet cat! Yet, who better to understand your plight than your other group members? Most of all, after the storm settles, you guys can sit together and think of methods to ensure he… stays cooperative. Face-to-face confrontation is something that most of us tend to eschew but if at some point, the issue gets out of hand, some sort of heart-to-heart talk is inevitable. Do avoid going into the talk hostile – otherwise known as Gordon Ramsay style – and stay calm while conveying your thoughts. Yes, he might look that much more awake compared to the three of you who stayed up till 3am to finish your proposal, but in a broader perspective, three hours more of sleeping or gaming doesn’t condemn him to hell for all eternity. As far as possible, try not to yell at him, as it’s probably not in your interests for him to hate you for the remaining one and a half years – he’s still going to be your groupmate, and ultimately classmate, anyway. The most conducive sort of discussion is one where all parties genuinely want to contribute to a common objective (and let’s face it, who doesn’t want an A?). He might be less inclined to sit down for future group discussions if it’s with three scary group members who just went all Hulk-mode on him. Worse still, he might even get offended and completely avoid associating with the rest of your group. Always remember, he might not realise that he isn’t pulling his own weight. Before jumping ahead to strangle or him, address the issue with him directly, and sit him down for a good talk. Maybe if he knows how much of a pain he is, he might take some effort to improve. On a side note – if you’ve read everything so far and thought, “What if I think I’m contributing but nobody responds to me in meetings/everybody hates me?”, you’d do well to read this post. Surprise surprise, if you find that a lot of these reasons are applicable to you – or you’re repeatedly reminded you fall into some of those categories – perhaps it’s time you mended the broken bridge and save yourself from any further (bodily) harm. Yes, your PW teacher does have a heavy influence on your PW grade. Relax, you probably won’t be marked down because you went to him about your group mate. Your teacher is ultimately there to help you (though it may not seem like it at times) and for all you know, he/she could already have noticed the distance (or tension) between your groupmates, possibly making him/her just the right person to consult. After all, our teachers have guided countless PW groups – they probably have tons of experience in dealing with problematic groups. No doubt he/she will be able to give you good advice, and, if he/she feels it appropriate, vindicate your feelings by giving that group mate the new ‘T’ grade while you and your other group mates get A’s. Of course, that’s hardly to say that consulting your teacher will definitely result in such harsh action. If things get bad, just ask your teacher to help you and see where it goes from there. Do take caution though, for this option should always be a last resort. There have been rumours (the veracity of which are uncertain) that groups who go to PW teachers with complaints such as these may get marked down. Sadly, this is the portion where we tell you that there’s nothing else you can do. Perhaps, if there’s such a thing as karma, it’ll reward you in the long run. With your other group members, we’re sure you can do it! Because ultimately, group work is something you’re going to have to deal with at every stage of your life, even when you graduate and start work, so you might as well start coping with it sooner rather than later. Don’t kid yourself if you say you love group work – let’s face it, it’s just not true. We’ve all felt your annoyance – there are always co-workers who don’t contribute, co-workers who produce terribly substandard work far from your perfectionist standards, or worse, the self-righteous co-workers who’re never wrong. But those are stories for other times – and other questions. Hope this helps! If not, good luck – you’re in for a long ride. 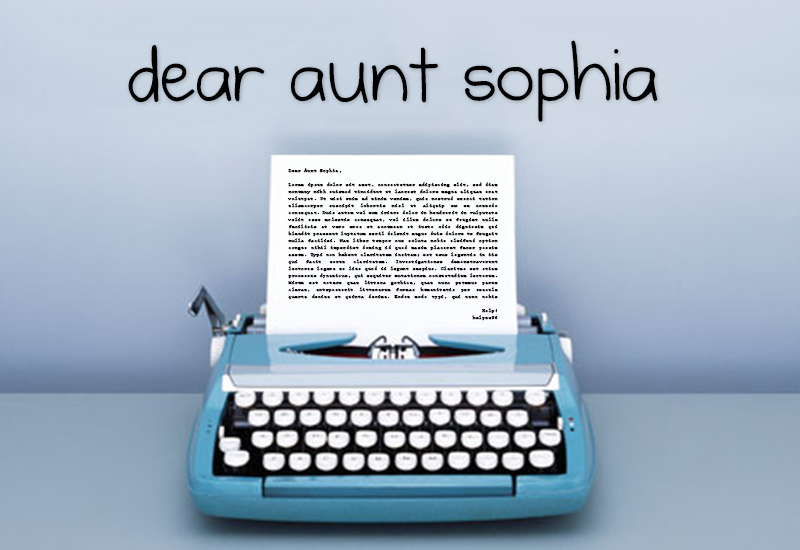 NB: Aunt Sophia isn’t normally as sarcastic as you might have just read – Uncle Stamford sometimes weasels his way into our editing room just before we hit post and makes changes we don’t know about until it’s too late. Sneaky guy.